The verdict is in. A unanimous jury made up of five men and three women has awarded Apple $538.6 million in the damages retrial of the long running Apple v. Samsung patent infringement case. The big issue in this trial was whether Samsung owed Apple for the complete value of each phone it sold with un-licensed Apple parts inside, or whether the damages should be limited to the value of the infringed part that Samsung used without permission. In the original trial, jurors were told that an "article of manufacture" could only be the complete phone, thus robbing them of a second option. 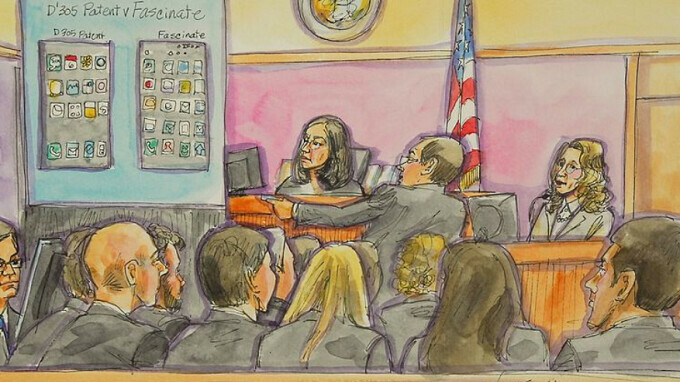 Last month, Judge Lucy Koh said that the faulty instructions resulted in a bias against Samsung and that the burden of proof was on Apple to prove that the damages should be based on the value of the entire handset. While Apple said that the damages should come to $1 billion, Samsung obviously came up with a much lower $28 million. The jury nearly met both sides half way. Apple and Samsung ended up here after the Supreme Court remanded the case back to federal court, where a new trial was ordered. Samsung had already paid Apple $548 million and $399 million of that was the subject of the current trial. The jury today awarded Apple $533,316,606 for infringement of its design patents, and $5,325,050 for infringement of its utility patents. Lol @ Samsung wanting to settle for $28mil basically admitting patent infringement. Well seeing as how most of the patents in that lawsuit we're invalidated it pretty much makes sense that they shouldn't owe anywhere near the original amount. When did the jury invalidate Apple's patents? Just to help out you and Apple-Rulz, in an appeals court, you do not get to retry the case in terms of innocence, guilt, or liability. They only review the process of determining liability and determine if the proceedings were fair. So, Samsung was liable based on the first trial and couldn't argue otherwise. They could only get damages reduced. We'll lol@ you instead. Your comment was so stupid in its pathetic attempt to show you possess legal erudition, that I’ll just LOL at your attempt to make yourself feel good, because clearly you didn’t understand anything I wrote. “Sigh”, here is what I originally wrote “Hopefully Samsung just pays and shuts up, since they (Samsung) admitted they knowingly infringed on Apple patents.” Now how either of you idiots extrapolates that I was implying that Samsung appeals or does anything else, is beyond me, especially given what I wrote. So yes, it is painfully clear you both are too stupid to understand what I wrote. That's true only for ECHR. Has Apple lost a similar case in Korea? Lol, how people can be this delusional and somehow still somewhat function is a marvel of the universe. If I tell you to make me a sandwich and you do it how I want, it’s my sandwich- with a side of denial of course. Nahhh Galaxy S9 knocked out iPhone X https://www.macrumors.com/2018/03/01/samsung-galaxy-s9-best-smartphone-display/ So you have failed trolling. They taught them nothing. They bought Samsung product because it's the best on the market, and consistently improves. "Apple taught Samsung how to build superior quality displays" Are you actually this much of an Apple fanboy? Samsung is the experts on Oled panels in smartphones, and they without a doubt have much more expertise than any other company, as they are the ones that have been working and developing these panels for years, while no other company has. Apple badly needed Samsung for those displays, while Samsung didn't need Apple at all when they produce their phones. Are you really that much of an idiot? It's a well known fact that Samsung for years calibrated their screens to be a bit warmer in colortone so that the screen seemed more vibrant. They were not the only ones who did that, Motorola for example did the same with several of their phones, especially the ones that used AMOLED screens. It's only because an accurate color-reproduction became a thing to judge phones by that this changed. Nowadays on multiple phones you can choose to have a different setting for your screen. Don't delude yourself into thinking Apple taught Samsung how to build superior screens, Apple doesn't know the first thing about building screens themselves, they can only list demands. They'd only get more in trouble by following that kind of thinking. This is not a child's play and there are legal repurcussions besides it'll also hurt Samsung's image if they're intentionally supplying inferior products to their clients. Once again you have failed in life-the S9 series came after, AFTER the iPhone X, giving Samsung time to learn the methods of proper calibration from the X and apply it to the S9’s. The iPhone X beat the Note 8, S8’s and everything else. You can’t even troll correctly so do yourself a favor and stop trying. Nahh.. seriously you can't accept the fact that the only time Apple beat Samsung was in the iPhone X. Then it only lasted for months when the Galaxy S9 arrived. LOL Even Apple won't believe your trolling. LOL Once again, your typical Apple is god attitude makes you a slave for Apple. They didn't learn proper calibration from Apple. You're ridiculous. Their displays improved every iteration, starting well before Apple started using them. Then explain how the iPhone X was able to leapfrog everything Samsung had previously made, up to and including the Note 8? You can love Samsung all you want, but don’t be ridiculous in your defense of them. Really? You're saying other people are being ridiculous in their "defense" of Samsung. Have you seen yourself and the way you're trying to attack Samsung, by acting like Apple is better at the very area that Samsung is the biggest experts on in the world, smartphone Oled panels. You're ridiculous. Samsung is the experts of smartphone Oled panels, as they have been developing and producing these panels much before anyone else. There is a reason Samsung produce the best panels out there, and that other companies are having trouble keeping up with their high standard of display quality. You're laughable deluded in your view of Samsung and Apple, and I don't think I have to say which one you're biased against, just look at your name. Do you (both sides) really see (with the naked eye) any difference between the displays ot S8(9) and iP X or you are just talking about cold figures that nobody gives a s**t in real life usage? !